Every year it seems that there’s a new off-site event during San Diego Comic-Con and this year wasn’t any different. One of the larger events that went on was The Walking Dead Escape. AMC’s “The Walking Dead” took over PETCO Park and infested it with Walkers. You could either join the horde as a zombie, a survivor or just be a spectator. I think it’s awesome that people thought about using those helmet cameras. It’s almost like we’re there! But safe in our homes not being chased by crazy people. It’ll be interesting to see if they bring this back next year. I know it’s early but I expect “The Walking Dead” to be a staple at San Diego Comic Con for years to come. If they do bring it back, I wonder if they’ll adjust anything like the prices or the course itself. If you took part, feel free to add your comments! We’d love to hear from you! 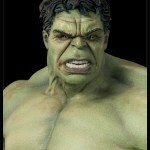 Remember that the Hulk Maquette will be available for Pre-Order through the Sideshow Newsletter on Thursday, July 26th, 2012, which is typically published between 2PM and 3PM (Pacific Time). For those of you who can’t wait to see the full reveal of this Marvel collectible, we’re posting the product gallery and info a bit early (see below). 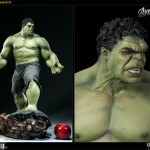 The Hulk Maquette will be priced at $649.99 and will have payment plans available. Make sure you log into your newsletter account on July 26th, 2012 to secure this piece for your collection. Remember, you need to be signed up for the newsletter to get all the information! 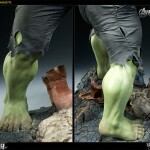 You can handle that at Sideshow Collectibles. Here’s a few photos that they’ve released as well. If you purchase this, I salute you! Nerd HQ had a party every single night of San Diego International Comic-Con and they would out last most parties in the Gaslamp District that weekend. Nobody parties likes Nerds do. Block 16 is a cool place to dance all night long and they pour a stiff drink. The food is served by Lucky’s Diner in the front and it is delicious stuff. Please visit there and thank the staff and owners for a good time the next time you are in San Diego. So not only are the panels jam packed with great celebrities and visionary artists, but they are much more accessible than Comic-Con panels are. Their site crashed during sales too, but they got it handled quickly and even add extra panels to make up for the sold out ones. Plus it’s nice knowing that you have an assigned seat and that your money is going to give someone the gift of a smile. That makes me smile. They were well organized and ready for the crowds that anxiously awaited their turn for a Conversation Panel. I personally enjoyed Terry Crews, Randy Couture, and Dolph Lundgren for Expendables 2 sharing stories and doing their Arnold impressions when ever they brought him up. Like everybody does. I also bought a ticket for the Rise of the Guardians with Guillermo Del Toro and Peter Ramsey. Zachary Levi sat in on that conversation, because……well it’s Guillermo Del Toro. 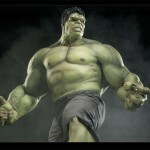 After watching that conversation I would love to pick his brain for hours and look forward to that movie. That was an enlightening experience to be in the same room as Guillermo and have a tiny glimpse into the beautiful mind of madness. Zach was directing the tone of the party with microphone in hand and singing along with his favorite songs. The VIP platform, for the slew of celebrities that frequented Zach’s parties, was in sight of the dance floor and very interactive for the fans; but that’s not the real driving force behind this all weekend party. The Chuck cast danced the night away as other celebs came and went, but that is not the reason that there is a special feeling that is palpable. This place has a reason to celebrate and they worked hard to have all this fun. Nerd HQ, like The Nerd Machine, is ran by loving people that volunteer their time and efforts to make all of this happen for us and the world. David and Zachary have raised thousands of dollars for Operation Smile through The Nerd Machine. In only it’s second year they raised $140,000 for Operation Smile. That is no small accomplishment and in fact it is pretty Fraking amazing. Considering they raised $40,000 in year one…..it begs the question. How much can they raise next year? Steph reached out to me on Twitter to tell me that she will be forever grateful to the way she was treated at Nerd HQ. She tells me it’s not easy to be an autistic adult, but she did not feel that way when she was there and complete strangers helped her cross the street. Other stories like that have been popping up left and right. This place is full of genuinely kind hearted people that I have watched give of themselves, not just $, time and time again. I am in awe of these Nerds and wish the world had more people like them in it. I highly recommend taking a detour from the normal Comic-Con routine and head on over to Nerd HQ in 2013. There are video games at every booth and entertainment all day long. Good times and good people. If bumping into the cast of Psych, Castle, Supernatural, Dr Who, Grimm, Robot Chicken, or the man himself Stan Lee isn’t enough to get you motivated to visit Nerd HQ…….then do it to make a difference. 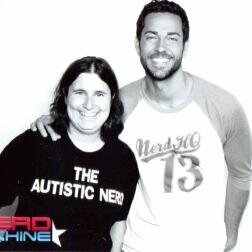 Thanks for changing people’s lives Zachary Levi, David Coleman, and Courtney Coleman. Thank you Nerds for making a difference. We spent 7 days in San Diego soaking up the sun, surfing the waves, and playing on the beach – at least in spirit! This year marked our premiere year at SDCC with our own booth – and we could not be happier with the results. We set out to do something different, something unique, something for the fans, and we raised awareness for a good cause at the same time! Our booth at SDCC this year was a community build – a POWER RANGERS MEGA MURAL! We designed our entire booth to house a giant 7′ x 5′ Mega Bloks community build wall that showcased a Red Ranger Super Samurai mask. This was not any ordinary build – we invited anyone attending SDCC to drop by our booth and add some blocks to the wall to help us complete it in 4 days – and thousands of fans did! Not only was this wall a way for fans to engage, meet the Mega Bloks community team, and learn about our toys – it was built with a goal – to help raise awareness for Autism Speaks. This is a cause we have been very dedicated towards for a few years now, in fact this year at the Autism Speaks Walk in Montreal we helped raise $60,000. We had a few surprises for the fans along the way – both the Power Rangers Super Samurai and Power Rangers Megaforce dropped by to add a few bloks to the mural and hang out with the fans – we even had a surprise visit from Walter E. Jones, also know as Zack the original black Ranger. After the wall was completed we donated it to a local organization that works with families dealing with Autism, Motiva Associates. On the Monday following SDCC the wall was “officially” donated to Motiva Associates at their space in Chula Vista where we invited all there clients and their families to share in the celebration, see the Mural completed, and meet the Power Rangers! The kids had an opportunity to shake hands with the Power Rangers and get their picture taken – plus they were treated to a pizza lunch and each giving a loot bag filled with Mega Bloks Power Rangers Super Samurai toys. Helping build the Power Rangers Mega Mural was fun for everyone and as added bonus we ran a twitter contest. Anyone attending SDCC could enter by taking a picture of the Mega Mural and tweeting it with the hashtag#PowerRangersMegaMural for a chance to WIN a Mega Bloks Power Rangers Super Samurai Claw Armor Megazord. Contestants had a 2nd opportunity to enter by heading out to Saban Brands unveiling of the POWERful 3D Mural at 5th and Island in the Gaslamp District, created to celebrate the 20th anniversary of the iconic Power Rangers franchise, where they could take a picture of the 3D mural and tweet it with #PowerRangers3DMural. Here fans had the opportunity to meet the cast of Power Rangers Super Samurai – we were on location handing out exclusive SDCC Mega Bloks Power Rangers Super Samurai Claw Armor Megazord posters and mini action figure mystery packs that the cast was signing. If you were lucky enough to find a Golden Ticket during SDCC you could redeem it for 1 of 50 exclusive SDCC Mega Bloks Power Rangers Super Samurai Claw Armor Megazord posters signed by the entire cast of Power Rangers Super Samurai. It wasn’t all about the Power Rangers – we also held a Mega Bloks Halo Trivia Meet at the Hard Rock Hotel where fans had the opportunity to meet the Mega Bloks community team and Bs Angel from Waypoint. We gave away a ton of Mega Bloks Halo sets and answered the fans questions. We had a busy week but it was totally worth it! We met tons of fans and made new friends and could not be happier about all the help and amazing feedback we received with our Power Rangers Mega Mural! We’re excited to announce the twitter contest winner on August 1st, 2012 and we have some great footage to share with everyone! During the Mega Mural build we had a camera setup to snap a photo every minute to document the process – we have over 3000 photos to compile into an inspiring and amazing time lapse. We are also working on a mini documentary of our time spent at SDCC this year! Make sure to follow us on twitter and like us on facebook to stay in the loop. You can also check out our SDCC flickr set to relive some great memories! Caught in the middle of a high-intensity struggle for survival, you fight off hordes of flesh-hungry, growling “walkers,” or zombies. No place is safe as you make your way through a post-apocalyptic wasteland with horror at every turn. Will you survive? This fall, Universal Orlando Resort and Universal Studios Hollywoodare joining forces with AMC’s “The Walking Dead” for their Halloween Horror Nights events. 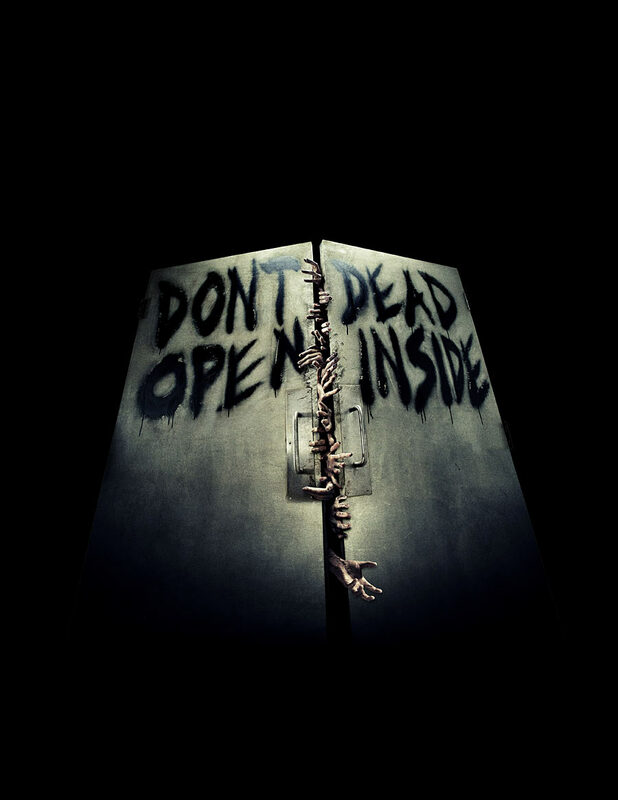 Visitors to both theme parks will be able to experience the horror of AMC’s blockbuster original series, “The Walking Dead,” in elaborately themed, haunted mazes. 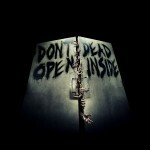 It marks the first-time Universal Studios has featured a television series at Halloween Horror Nights on both coasts. For more information about Halloween Horror Nights at both Universal Orlando Resort and Universal Studios Hollywood, visit www.HalloweenHorrorNights.com. Watch The Walking Dead announcement video on bothUniversal Orlando Resort’s YouTube Channel and on Universal Studios Hollywood’s YouTube Channel. AMC reigns as the only cable network in history to ever win the Emmy® Award for Outstanding Drama Series four years in a row, as well as the Golden Globe® Award for Best Television Series – Drama for three consecutive years. Whether commemorating favorite films from every genre and decade or creating acclaimed original programming, the AMC experience is an uncompromising celebration of great stories. AMC’s original stories include “Mad Men,” “Breaking Bad,” “The Walking Dead,” “The Killing” and “Hell on Wheels.” AMC further demonstrates its commitment to the art of storytelling with its slate of unscripted original series, as well as curated movie franchises like AMC’s Can’t Get Enough and AMC’s Crazy About. AMC is owned and operated by AMC Networks Inc. and its sister networks include IFC, Sundance Channel and WE tv. AMC is available across all platforms, including on-air, online, on demand and mobile. AMC: Story Matters Here. The Hilton Bayfront has two contests going on right now where the winner will score a 2 night stay during Comic-Con 2013! How amazing is that? They say it’s a $800 value. Here’s the breakdown of the contests! Contest #1: “Like” us to Win a 2-night stay over Comic Con 2013! Once you “Like” us you are automatically entered to win a stay! Only new “Likes” from 7/12-7/20 at midnight p.s.t. will be entered. Now for those of you who have already “Liked” us…check out the details to our 2nd contest for your chance to win! Contest #2: Post your most creative photo of you and/or your friends during Comic Con somewhere on the Bayfront property or with it somewhere in your photo for a chance to win a 2-night stay for Comic Con 2013!! To enter post your photo on our Facebook page from 7/12-7/20 by midnight p.s.t. to be eligible. Voting will open once all photos have been submitted. The photo with the most “Likes” will win the 2-night stay. For photos to be eligible, it must be easily recognizable that the photo was taken at the Hilton Bayfront. For those of you who have already “Liked” us or are unable to physically be at Comic Con..you are able to participate by voting for your favorite photo posted. Once voting opens, vote for your favorite photo by “Liking” it and it will automatically enter you to win a 2-night stay to Comic Con 2013!! he whole point of NerdHQ (besides bringing everyone together) is to raise money for OperationSmile. Every dollar made goes to that charity. It’s really a win/win for everyone. The fans get to see their favorite celebrity up close & personal and in some cases, that means really personal. Wait, what?! Is that Nathan joining in on the fun? Followed by Adam Baldwin? Just another example of the random and awesome surprises you’ll find at NerdHQ!